Hey there. It's review time! Let's go into the great vault-o-stuff and see what we have in store today. 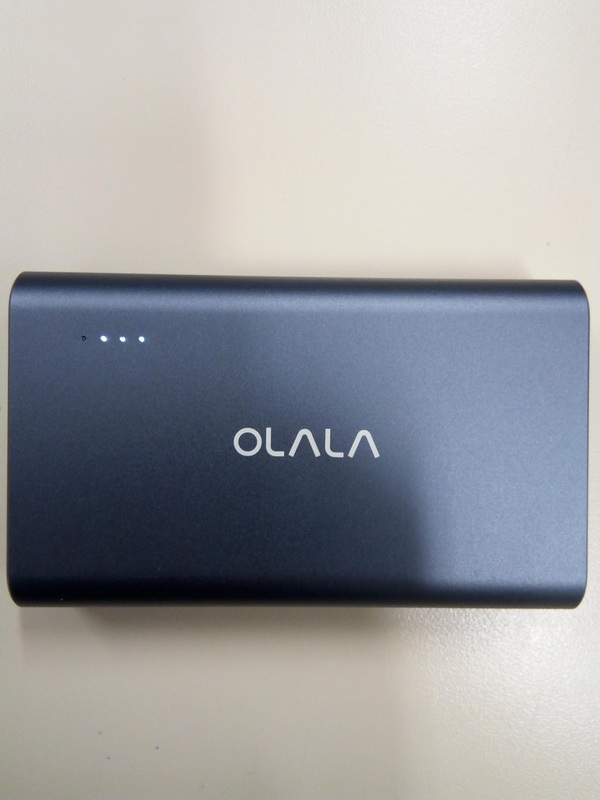 Today's item: The OLALA 10500mAh 2 Port Power Bank with Quick Charge 3.0. Our good friends at OLALA provided me with this awesome power bank to try out and review and after a few weeks of carrying this bad boy around with me, I'm ready to give you the scoop on just how well this thing works! But before we get into the specs... I wanted to make mention that I am adding a new section to my reviews. I'm now adding a, "PACKAGE," section. I noticed that the packaging is part of your first impression that I decided it would be good to add that to my reviews. Now that that is out of the way... let's talk SPECS! Full Charge from Dead to 100% in Approx. 5 Hrs. The OLALA Power Bank comes in a plain, brown box with a color sleeve that goes over it. The sleeve is in color and provides pretty everything that you need to know about the power bank. Even though the packaging seems pretty small, it does pack a lot of info on it. I especially liked that right in the front is the 5 star rating for safety. It stands out and it's a great assurance to the consumer that you're getting a product that will not destroy your stuff. Once you pull off the sleeve, there is a single sticker/seal over the opening of the box to guarantee that the box has not been opened. Now that I got that out of the way, let's see what's inside. 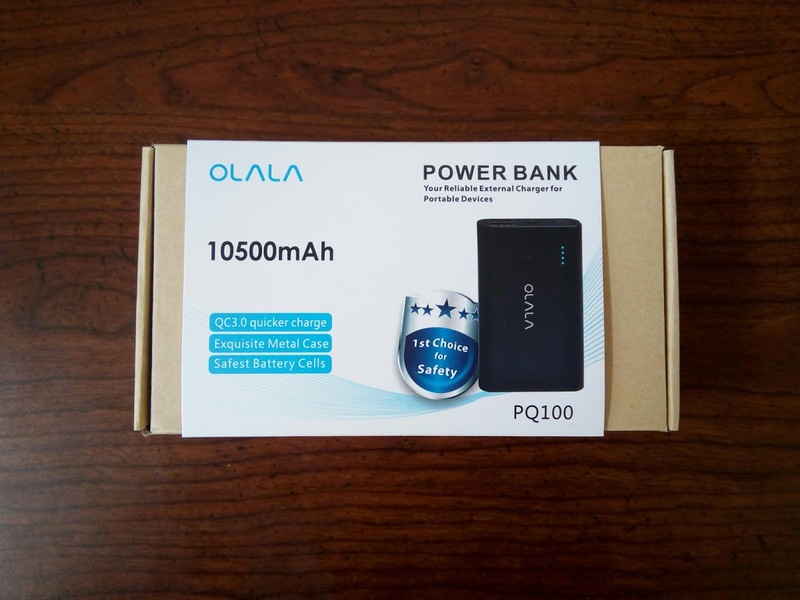 After cracking the box open, you see a thank you card from OLALA, an instruction booklet, and a QR code so that you can follow them on Facebook and get a chance to win a free power bank. I like the idea of companies giving consumers the chance of getting more of their stuff for free. Once you move the card out of the way, you have the power bank neatly wrapped and placed inside a secure plastic tray that fits snugly in the box. I removed the power bank and unwrapped it. This thing looks real, real nice. It was a great modern design and it is relatively small. It looks nothing like other power banks that I've owned that were the size of bricks. This thing can easily fit into a travel bag/purse/pocket and it not be bulky. I also love the aluminum alloy finish. It feels very sturdy, but it also feels light. Again, nothing like some of the other power banks that I have previously owned. On one end you have the specs of the power bank and on the other, are the ports and the power button. It looks like only one of the ports has the Quick Charge capability and it is clearly marked. On the front side, the OLALA name sits right in the middle while 4 tiny holes are on the top left side. My guess is those holes are the indicator light display. I pressed the power button out of curiousity and sure enough, white lights light up and filled in 2 of the 4 holes. I'm certain that these indicate the charge left in the OLALA power bank, each light representing at least 25% of power (ie. 3 lights would equal approx. 75% charge left). In case you're wondering, the charging cable is also in the box. It's merely hidden underneath the plastic tray that housed the power bank. 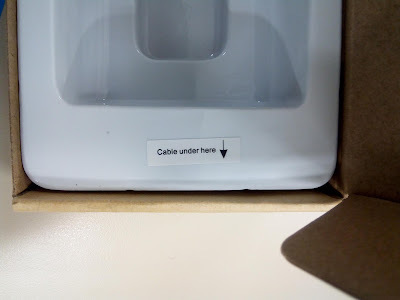 And... just in case you don't know where, OLALA placed a small sticker on the tray stating, "Cable under here." This got a good chuckle out of me. Someone out there must have complained that their power bank didn't come with a charging cable so OLALA felt the need to let everyone know going forward that the cable is under the tray. lol It's pretty common knowledge that if you don't see the cable on top of the tray, it's going to be under the tray. I just thought it was hilarious and thought it was a worth a mention. So now... let's charge this baby up and get started! At least 75%? Good enough for a few full charges! Let's go!!! Using the charging cable that came with the power bank, the charging time for the OLALA 10500mAh 2 Port Power Bank from dead to 100% was approx. 5 hours. That's not too bad, actually. The power bank has the capacity to charge up your powered up smart phone almost 3 times over so if you were to leave the power bank to charge over night, you'd be good to go in the morning. Also, since the power bank has some of the top of the line safety measures in place, you do not have to worry about over charging it or it getting over heated. I haven't had an issue with other power banks and over charging, but I did have a few that would over heat. They would literally feel more than warm to the touch. I knew that wasn't good, so I would avoid using those particular power banks unless absolutely necessary. I ended up throwing it away... But anyways, the OLALA power bank kept it's cool the whole time! I don't know if it has some kind of thermodynamic magic going on inside or if its all because of the aluminum alloy case, but I can guarantee you that you will not have to worry about the power bank heating up on you. As mentioned, the 4 lights will indicate the level of charge the power bank has, it also plays the role of indicating the charge level while charging. As the power bank charges, one of the 4 indicator lights will blink. As it charges up, the blinking indicator light will stay light up and the next light in line will start to blink. This will give you a great idea as to how far along the charging process it is. If you have 1 light on and the one next to it is blinking, then you know the power bank has anywhere between 25% to 50% charge. It's a quick way to see the current charge level during charging. Now, the OLALA 10500mAh 2 Port Power Bank can charge up to 2 devices at once. One of the ports is labeled Qiuck Charge and the other is labeled Auto IC Out. I'm assuming that the Auto IC port is a smart port that will automatically detect the best charge for your device. That type of charging capability seems to be standard in power banks now a days. But the port that I really want to put to the test is the Quick Charge port. From what I know, Quick Charge 3.0 should be able to charge devices close to 4X FASTER than standard charging ports. 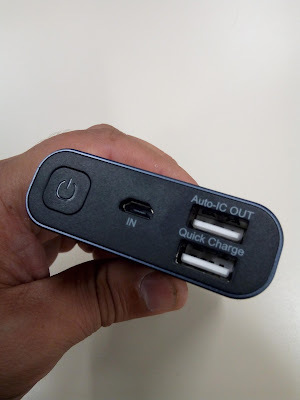 To test this, I let my smart phone die out on me and charge up using the Auto IC port and then repeat the process using the Quick Charge port. Because I'm a techie and I can't live without my phone, I immediately turned on the phone and had it on during charging. So charging times may differ based on that alone. So after plugging in, pressing the power button, I set the timer. Now... we wait. Waiting time is over! The results? Quick Charge is definitely faster and almost 4 times faster too. My phone fully charged up using the Auto IC port in about 2 hours and 45 minutes. A steady charge that falls in line with many of the other power banks that I've used. My phone fully charged in about 45 minutes using the Quick Charge port. WHAT?!?! 45 minutes! That's insanely fast and pretty cool, if you ask me. I LOVE IT! I travel a lot so I can't stress enough how many times I've needed my phone to charge quickly while on the go. This is absolutely PERFECT for situations like that! Mind you, the quick charge will also drain the charge held by the power bank quicker, but it's a great trade off if it saves time. And the absolute best part of it all was that the power bank did not get hot at all. Not even a little bit! That's just too awesome. The power bank is small enough to fit in my dress shirt pocket and I don't need to worry about it burning a hole in my shirt (exaggeration, guys lol) because it got too hot. I also wanted to see if charging times suffered if I were to charge up 2 devices at once. I didn't notice any decline in charging times when I had my smartphone and my Kindle Fire Tablet charging so I am comfortable saying that the performance will not suffer. A few things to make note, though. It is best if you use the charging cable that came with the power bank. I cannot emphasize enough the importance of a great charging cable. If you use a weak cable, you will not get the best performance. The power bank comes with a Micro USB cable that is perfect for Android smartphones, tablets, and all other devices that charge up with it, but it leaves you Apple lovers out. But fear not! The OLALA 10500mAh Power Bank is Apple MFi Certified so as long as you have a great lightning cable, you are good to go! Like all rechargeable batteries cells, the super awesome Panasonic Lithium Ion rechargeable battery cells in the OLALA power bank is set to last for over 500 charges. Generally speaking, if you were to charge this bad boy up every day, you are looking at about 2 years of rechargeable awesomeness. Honestly, I think it'll last a long longer than that. From experience, I've noticed that power banks usually lose about 10% of their full capacity after about 100 full charges. Unless you are a power hungry techie that drains the crap out of their devices at insane speeds, you will not need to charge up your power bank on a daily basis. Therefore, it should last you longer than 2 years. Though, speaking from experience, I do suggest that you pick up a new power bank every 3 years time since that's when the capacity level drops to a point where it's only good for a single charge, if that. I absolutely love the OLALA 10500mAh 2 Port Power Bank. It's sleek, it's modern, it's portable, and the Quick Charge 3.0 port is simply amazing. We live in a digital world, friends, and we need to power our devices even when we are on the go. You need something like this awesome OLALA power bank in your life. You can pick one up now at Amazon for under $32! Don't cheat yourself and invest in a high quality power bank and you simply cannot go wrong with this one! So what do you look for in a power bank. Do you have any experience with Quick Charge? Let's hear it in the comments! Later!